Space-saving design with integrated arm stand provides 40% more usable desk area. WQHD resolution and 144Hz refresh rate for sharp images, even during fast motion scenes. Pay only P 2,335 a Month for 12 months. Or pay only P 4,422 a Month for 6 months. Oddly enough, what makes the Samsung S27R750 and S32R750 stand out is they are both constructed with a special stand. 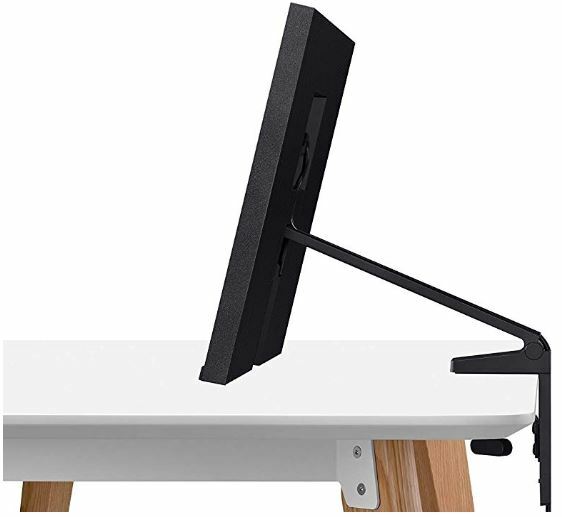 It’s clearly intended to emulate a traditional wall-mounted monitor stand, but it’s actually less obtrusive than some of those kinds of installations. 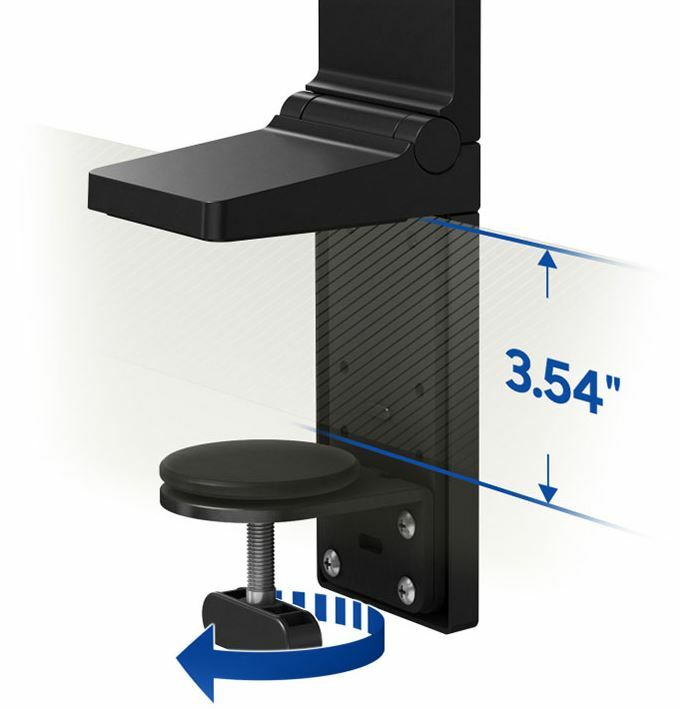 In fact, similar to many of the better third party stands on the market, this stand attaches itself to a desk by clamping down against the side of your workspace. The stability is great, provided that your desk is up to the task of having a monitor used in this fashion. Once in position, you’ll find the clamp keeps things anchored in place. Stand aside, how do these panels differ? There are really two ways: size and resolution. The S27R750 is a 27” monitor and the S32R750 is a 32” monitor. Technically, it’s a 31.5” panel, but that’s just what the industry has decided to call 32”. And the 27” version supports 1440p, while the 32” version offers full 4K support. The S27R750 weighs about 12lbs, while the S32R750 comes in closer to 15lbs. The difference in weight pertains to their difference in size. 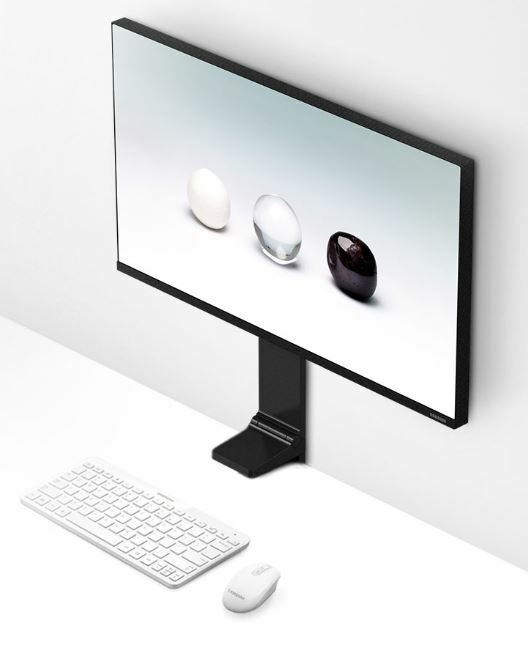 Because these monitors offer their own mounting solution, you don’t need to worry about those weights being a tad on the heavy side. Though they are a little heavy because the power brick is built-in to the display. Having the power brick stored inside the display is something you’ll appreciate when it comes time to run the power cable. The trade-off is that the display becomes a little less portable. But these monitors are inherently stationary, anyway. There are a couple of limitations to keep in mind, with respect to the stand. The maximum spread of the clamp is 3.54”. If your desk is any thicker than that, then you’re not going to be able to force the clamp on. Likewise, it would probably be inadvisable to use desks that were prone to shaking. If you install it properly, the clamp won’t wiggle off. But placed on a wobbly desk, your monitor may shake while you type. 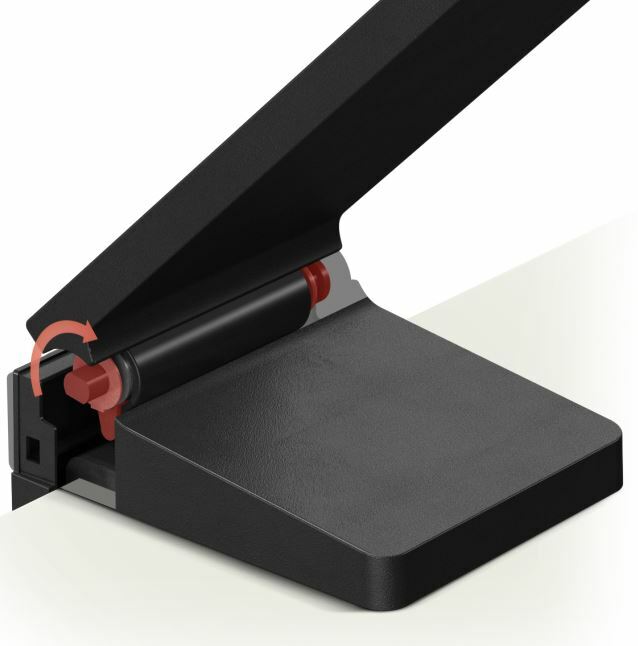 The stand is also built around a terrible robust and widely adaptable hinge. Physically speaking, the hinge is constructed from four industrial strength metal springs. 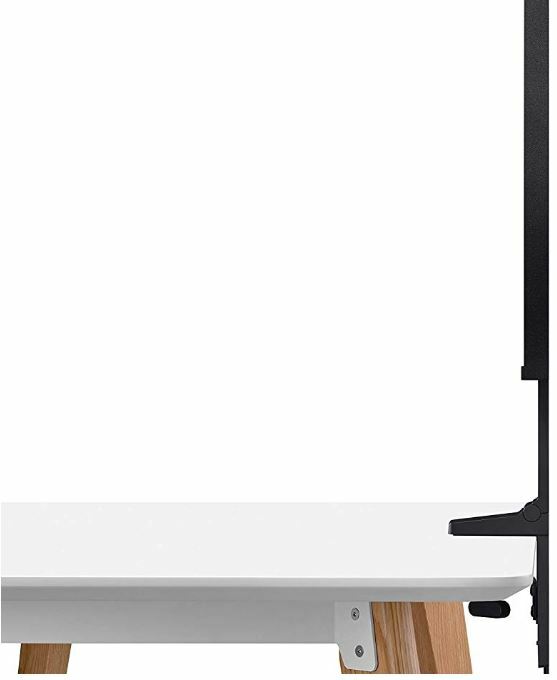 The idea behind having such a sturdy hinge is to keep consistent and reliable motions, such that every adjustment of the panel feels the same. Even though we’re just talking about a couple of springs, this design is actually Samsung’s proprietary technology, and it’s specially intended to withstand thousands upon thousands of adjustments. In short, the strength of the hinge means those movements remain smooth and precise now and in the future. Samsung did at least one thing perfectly. 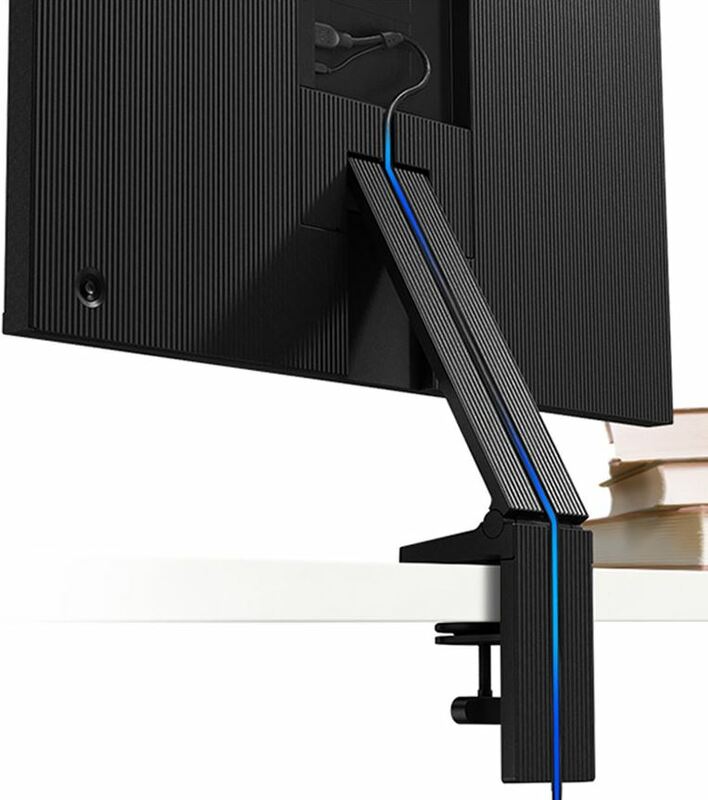 They allow you to conceal your power and HDMI cables by running them down a cable-valley that’s built into the backside of the stand. These recessed channels allow you to keep your workspace looking clean and organized while also preventing clutter and tangled wires. Further still, the backside of the panel has a large recessed area, which allows for cables to be positioned at a 90-degree angle. Samsung has decided to call their bezel three-sided. It basically means the bottom side has an ordinary sized bezel, while the top and sides of the panel have a bezel-free design. It looks great, though it does make you wonder how many different ways they can describe bezels, since they’ve all become so thin. These panels are intended to provide almost endless adjustability. You can push them back against the wall, giving you an undisturbed workspace. When you’re ready to use your screen, you can just pull it forward again. It’s only when fully retracted against the wall that you realize how much space is being saved. A tall person might want the panel up high, and pushed back. But a child using the PC would probably need it pulled all the way down to eye level. 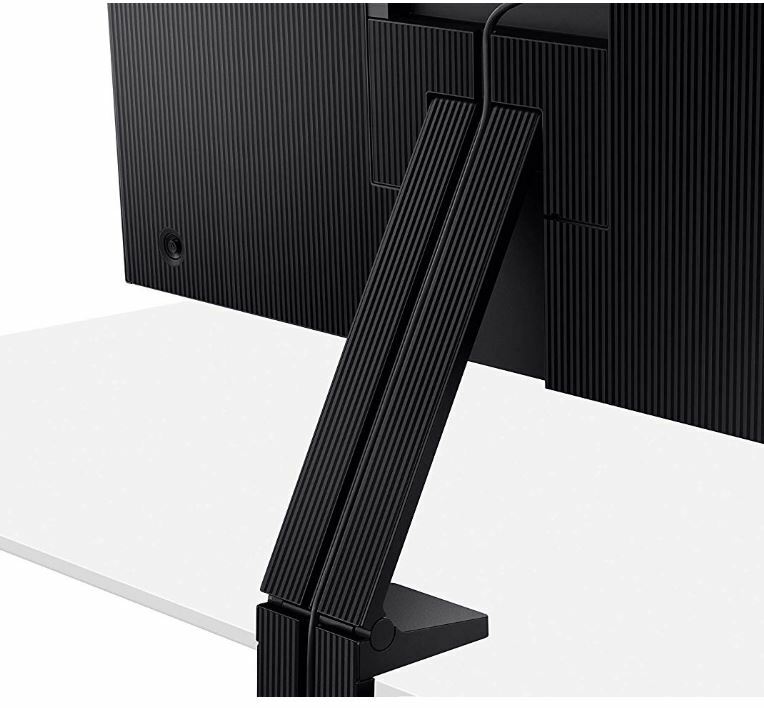 Even for one person using their PC all day, being able to adjust the height of your panel means it can accommodate adjustments in your posture or chair. Though the S27R750 and S32R750 are sized differently, and use different resolutions, they actually look similar in many circumstances. For many people, 1440p is really the sweet spot right now. Experientially speaking, using a 1440p monitor is roughly the same as using a 4K monitor. Additionally, 4K content still requires enormous computing power, an enormously expensive computer, incredible bandwidth, and so on. Though technically superior to 4K, experientially speaking, many people find it almost identical to 1440p. While people don’t struggle to tell 1080p and 1440p apart from each other, the leap from 1440p to 4K is actually a bit fuzzier. Technically speaking, the 32-inch version is ultimately the better-looking panel because it has more pixels per inch than its 27-inch counterpart. Even though it has to spread them over a larger area, its pixel density is still much greater. You might think that means the 32” version is better. But it’s not really that simple. Resolution is only important relative to screen size and viewing distance. 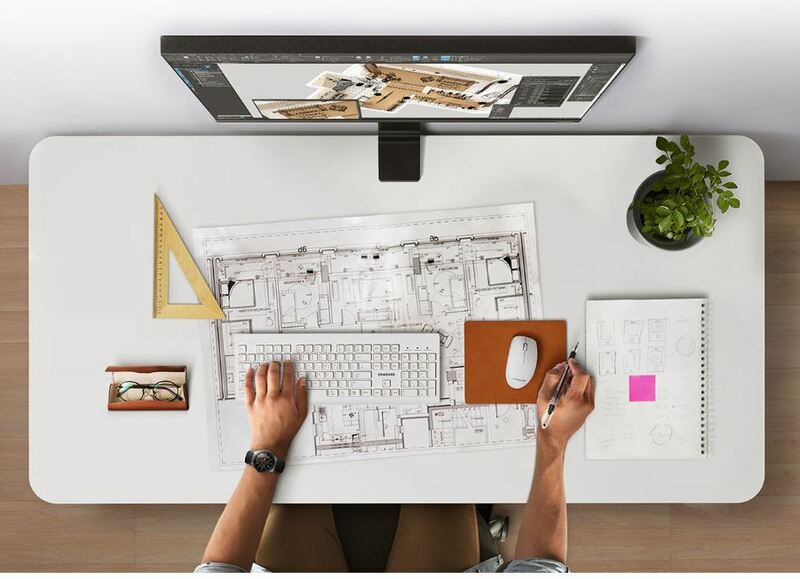 If you’re sitting within touching distance of your monitor, then you’ll probably be able to appreciate the leap to 4K. Outside of that distance, the rules begin to change. Both of these panels feature picture-in-picture mode and picture-by-picture mode. Whether you’re trying to create separate workspaces, or separate screens entirely, it’s nice to have options. Samsung also includes some multi-tasking software that lets you break the screen up into as many as half a dozen separate screens. 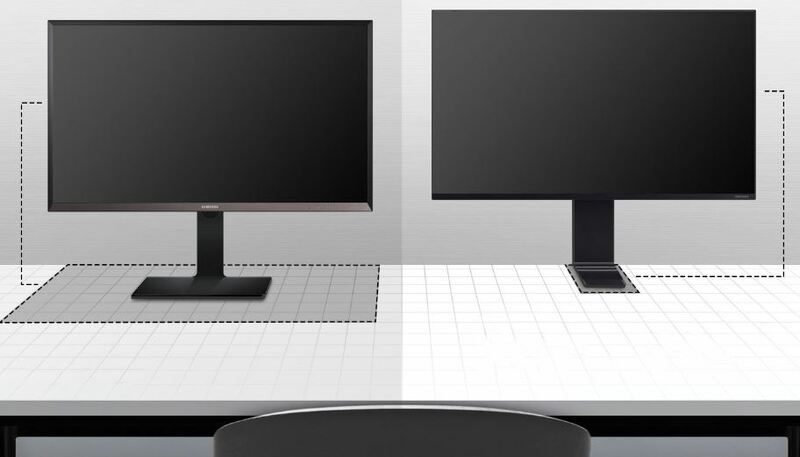 Because these monitors don’t use a traditional desk stand, there is an installation process you’ve got to deal with. Fortunately, it’s really not any more difficult than installing an ordinary monitor stand. At least, provided that you’re not dealing with any unusual installation conditions. You’ll need to make sure your desk is capable of supporting the clamping force. You probably wouldn’t want to use a wobbly desk, and you might not want to use a tempered glass desk. But provided it’s got the right place to take root, this stand is every bit as functional as any of the best comparable third party stands on the market. After you’ve got it seated in place, you’ll find the stand operates smoothly. It may also be worth noting the stand can operate without creating unnecessary noise. 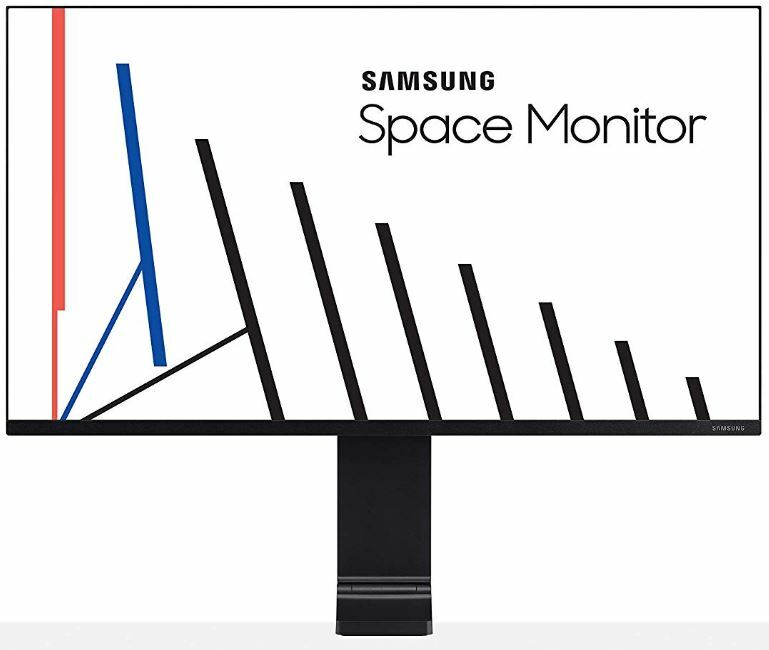 Samsung includes a warranty that will cover you for a couple of years, but monitors very rarely have issues. At least, unless they have issues immediately out of the box, at which point you’re covered by the warranty. These warranties usually only cover dead pixels if there are more than three or four. Unfortunately, that’s a standard practice used by essentially every brand. Fortunately, Samsung’s quality assurance department does a pretty good job of making sure people don’t encounter that kind of upsetting situation. There aren’t any speakers on these panels. That’s probably for the best because monitor speakers tend to sound terrible, and few people end up using them anyway. The HDMI port allows you to take care of the rest of your audio concerns. Though some people would have appreciated a 3.5mm audio port on the panel.